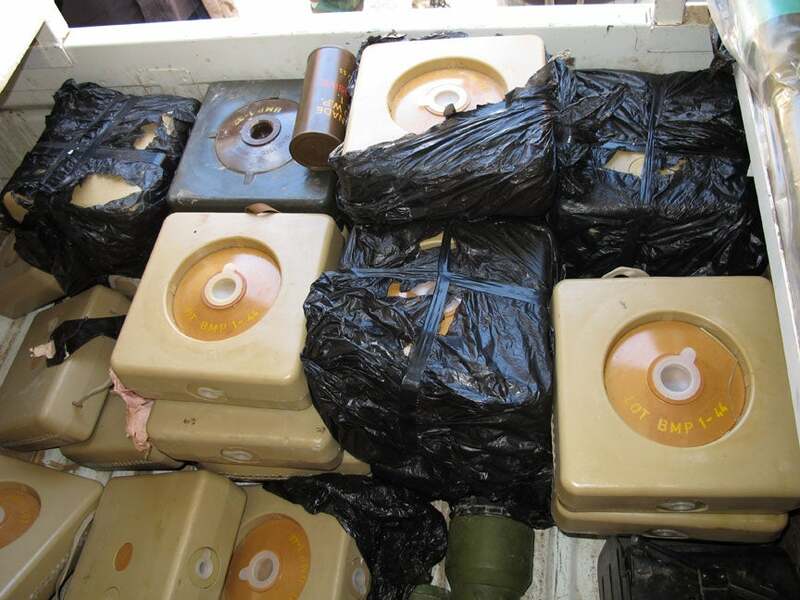 Metal cased antitank mines found in Ajdabiya on March 28, 2011. A man holds a disarmed metal-cased antitank mine found in Ajdabiya on March 28, 2011. A civil defense team found and disarmed 24 antivehicle mines and an estimated 30 to 40 antipersonnel mines. (Benghazi) - Muammar Gaddafi's forces have laid both antipersonnel and antivehicle mines during the current conflict with armed opposition groups, Human Rights Watch confirmed today. "Libya should immediately stop using antipersonnel mines, which most of the world banned years ago," said Peter Bouckaert, emergencies director at Human Rights Watch. "Gaddafi's forces should ensure that mines of every type that already have been laid are cleared as soon as possible to avoid civilian casualties." The mines - two dozen antivehicle mines and roughly three dozen antipersonnel mines - were found on the eastern outskirts of Ajdabiya, a town of 100,000 residents that government forces held from March 17 until March 27, 2011. Abdal Minam al-Shanti, electricity director for Eastern Libya, told Human Rights Watch that his employees discovered the mines around 11 a.m. on March 28, when their truck ran over and detonated two antipersonnel mines laid underneath power pylons about one kilometer from town. The mines destroyed one front tire and one back tire of the truck, but no one was wounded or killed, al-Shanti said. After detonating the mines, the electrical workers notified local civil defense workers who began searching for more mines in the area, al-Shanti said. In the immediate area where the mines had detonated, a civil defense team found and disarmed 24 antivehicle mines and an estimated 30 to 40 plastic antipersonnel mines, he said. The mines were found a few yards off the main road between Ajdabiya and Benghazi, in an area frequented by civilians in vehicles and on foot, Human Rights Watch said, and thus posed a direct threat to the civilian population. Given the pedestrian and vehicular traffic in the area, the mines were clearly laid while government forces were in Ajdabiya, Human Rights Watch said. Human Rights Watch has photos of the mines found near Ajdabiya, as well as video from the clearance operation. Libya is one of 37 nations that has not joined the 1997 Mine Ban Treaty. A total of 156 nations are parties to the treaty, and another two have signed but not yet ratified. The treaty comprehensively bans the use, production, and transfer of all antipersonnel mines, requires destruction of stockpiles within four years and clearance of mined areas within ten years, and calls for assistance to landmine victims. In recent years, the only government forces that have continued to lay antipersonnel mines are Burma's. In keeping with the international norm being established by the Mine Ban Treaty, Human Rights Watch condemns any use of antipersonnel mines by any party at any time. While antivehicle mines are not banned by the treaty, such mines are often used in violation of international humanitarian law, notably when they are used indiscriminately or deliberately to target civilians, or when adequate precautions are not taken to avoid civilian casualties. Prior to the March 28 discovery of the mines near Ajdabiya, Human Rights Watch had confirmed on March 24 that government forces left behind plastic antivehicle mines in the area around Ghar Yunis University in Benghazi during their retreat from the city on March 19. Those mines, which had not been armed and planted, were found by local residents and brought to an arms collection point in downtown Benghazi, where they were inspected by Human Rights Watch. At a military arms depot in Benghazi, a demining expert from the United Nations located 12 warehouses filled with tens of thousands of antivehicle mines. Rebel forces in Benghazi, now in control of the stockpile of antivehicle mines in the city's arms depot, told Human Rights Watch that they will not use any type of mines. The pledge was made by Gen. Khalifa Hufter, commander of the rebel forces in Eastern Libya, during a meeting in Benghazi on March 25. At this point, Human Rights Watch cannot independently confirm media reports that government forces have deployed mines around their stronghold of Sirte, and in the Wadi al-Ahmar area, 80 kilometers east of Sirte, where rebel forces are currently battling government forces. Libya has said in the past that it insists on the right to defend its extensive borders with mines. It has also said that it would cost too much to clear mines, as required by the treaty, and criticized the treaty for not requiring those who laid mines in the past to pay for clearance. Prior to this conflict, Libya is not known to have used antipersonnel mines since its war with Chad ended in 1987. Libya has said that it has never produced or exported mines. According to standard reference works, however, Libya imported antipersonnel mines in the past from the former Soviet Union and the former Yugoslavia. Libya still has large numbers of uncleared landmines and explosive remnants of war as a result of World War II, as well as conflicts with Egypt (1977) and Chad (1980-1987). Human Rights Watch is a founding member of the International Campaign to Ban Landmines (ICBL), the 1997 Nobel Peace Prize Laureate.